The whole area reeks of foul smell and the biofilter plant, commissioned in 2016 to control the odour, has not been effective. 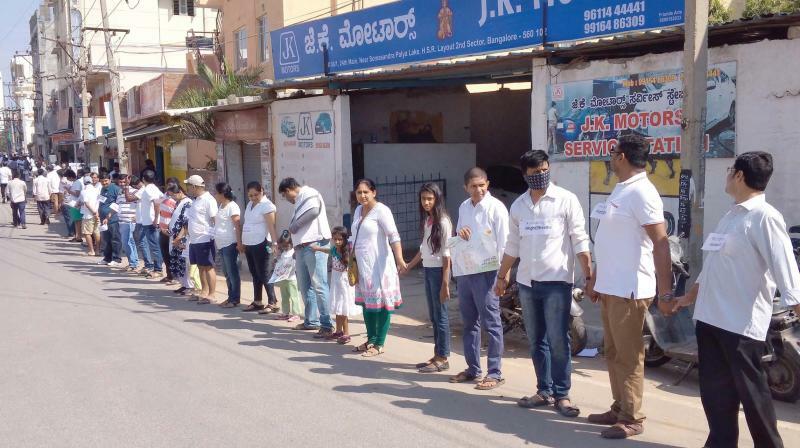 Bengaluru: The residents of HSR Layout turned out in large numbers near Somasundarapalya lake on Sunday demanding the shutting down of the Karnataka Compost Development Corporation (KCDC) unit, which they allege was polluting the environment and the ground water. They said the regulatory agencies have failed to provide any relief despite assurances. The whole area reeks of foul smell and the biofilter plant, commissioned in 2016 to control the odour, has not been effective. The protesters argue that though the BBMP-run composting plant can process only 75 tonnes of waste, it continues to process 200 tonnes. In August 2017, a Joint Action Team (JAT) comprising members of KHHSP Resident Welfare Association (RWA) and officials of KCDC, BBMP was formed to hold regular meetings to resolve the issues. The protestors also felt that a large amount of Refuse Derived Fuel (RDF) lying unattended on the premises was a safety hazard. It may be recalled that in February last year last year, it had caught fire. Over 6,123 citizens have signed an online petition with Jhatkaa on their air alert website demanding the shifting of the plant.